Many of you know Peyton was diagnosed with Eczema last year right before Kindergarten started. We had such an ordeal! Peyton had a severe eczema outbreak happening behind her right ear. I had never seen eczema before so I really didn’t think much of it. We went to get her a hair cut for her first day of school and even the hairdresser never said a word about it. Instead, she washed Peyton’s hair and while she was combing it out proclaimed Peyton had head lice. Well, that sure freaked everyone out in the salon, including me. I started to apologize profusely and asked what I needed to do. They proceeded to sell me a $60 lice removal kit and sent us on our way. I went home that night, freaking out over lice and started on our to-do list. I started all the bedding in hot water, put all her stuffed animals in trash bags and stuck them in the garage and started the time-consuming treatment of Peyton’s hair. I also had a lot of consoling to do with Peyton. She was extremely distraught. But while I was brushing her hair, each little strand, in four different directions, I noticed I did not see any head lice. What I saw was a sticky, gummy substance, which was the eczema-damaged skin. At the time I did not know it was eczema. I had no clue what it was but I was freaking out because I noticed the red patch behind her ear and on her neck. So I snapped a picture, sent it to my aunt (she’s a nurse) and picked up the phone. My aunt thought it looked like eczema but couldn’t tell. So we waited. I continued to clean and clean the house, just in case it was lice. A few days later I noticed that patch behind her ear was starting to look horrible so I took Peyton in to see a doctor. She was diagnosed with eczema. Peyton was having a particularly painful episode because of all the chemicals I had used on her scalp for the lice treatment. The doctor confirmed she never had lice, but she did have eczema on her neck and scalp. 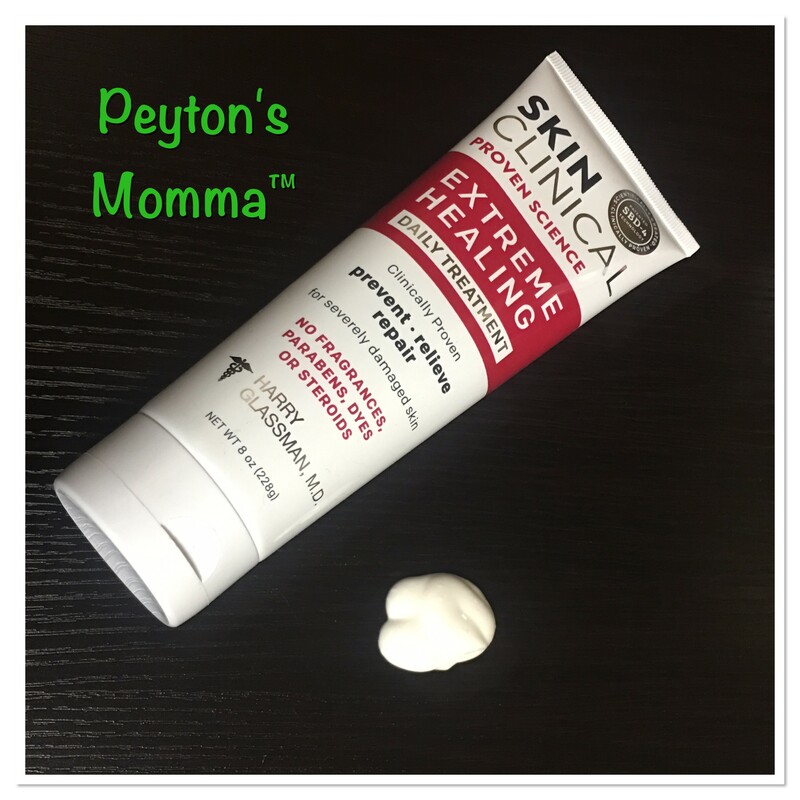 Because of the severity of Peyton’s current eczema outbreak we were given a prescription for a heavy duty steroid cream. On one hand, I was relieved Peyton did not have head lice but I was also furious they misdiagnosed her and caused all that pain for nothing. That was nearly 10 months ago. 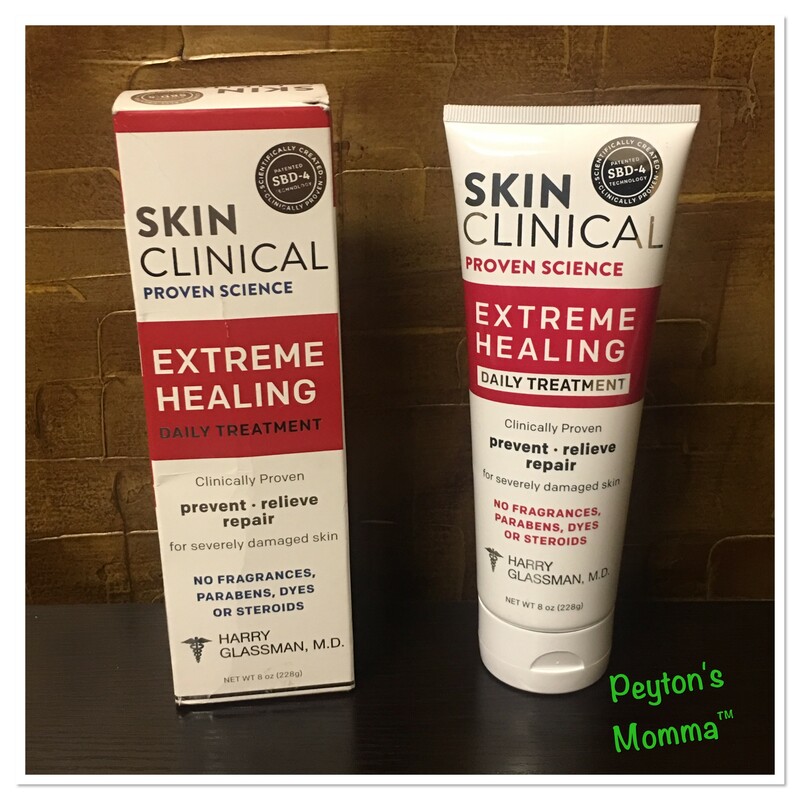 Now when Peyton starts to get a hot spot (that’s what I call eczema when it’s starting to damage the skin) I put Skin Clinical Extreme Healing on her. Peyton feels an instant relief from the discomfort and the spot clears up fairly quickly. I have never let her eczema get as bad as that first time. And thanks to Skin Clinical I have never had to use a steroid cream on my daughter again. Skin Clinical is a steroid free option. There are also no fragrances, parabens or dyes. Skin Clinical treats severely dry, delicate, itchy, red, inflamed, wounded, scarred or chapped skin. If you have kids in the home, let me tell you, this comes in handy often. I’ve used it on those monster mosquito bites to help take the itch and inflammation out. You can purchase Skin Clinical online, select pharmacies and at authorized medical spas, dermatologists, plastic surgeons, and skin care professionals.